Hospital officials say a Texas woman is in critical condition a day after four children died and five other people were sickened by an apparent accidental poisoning under her home. A spokesman for University Medical Center in Lubbock says 45-year-old Martha Balderas of Amarillo was in critical condition Tuesday, a day after she and the other victims were discovered by someone checking on the home. BSA Health System in Amarillo says five patients are in stable condition at its hospital. Medical experts who specialize in poison control say accidental poisonings from the active ingredient in the pest control substance that led to the death of four Amarillo children are not uncommon, but deaths from aluminum phosphide are rare. Fire officials say the children’s father spread a commercial grade pest control pellet under the family’s mobile house. Poisonous phosphine gas was released when he tried to wash away some of it away with water. Cynthia Aaron, the medical director for the Michigan Regional Poison Control Center at Children’s Hospital of Michigan, says the doctors at the center see mostly adults with exposure issues to phosphine gas from aluminum phosphide because the pesticide is used in industrial shipping. 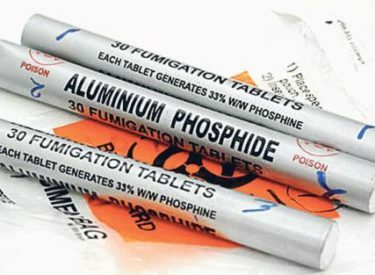 The American Association of Poison Control Centers reported 82 exposures to aluminum phosphide in 2015 with two deaths.